In Victor Hugo's The Hunchback of Notre Dame, the archdeacon holds up a book before the cathedral and says, "This will kill that. The book will kill the edifice. "1 Of course, we know that the printing press did not "kill" buildings. We still have cathedrals and books, and indeed, most books wouldn't survive very long unless stored in buildings. But we also know that the book changed cathedrals, which had been thought of as "books in stone," with the stories of the Bible depicted in the statuary and stained glass of those buildings. We still have cathedrals today, but they no longer have to serve also as books, and so they have changed in fundamental ways, becoming more abstract in form, more diverse in function, and largely shorn of their didactic ornament. I mention this because we find ourselves at another moment in time where we could hold up a digital device—a laptop, tablet, smartphone, or e-reader—and declare, in front of either a book or a building, that "this will kill that." While we know that such devices will not "kill" books or buildings for that matter, we have also gone far enough into the digital revolution to sense that digital media—and spatial media like geographic information systems—seem destined to have the same kind of effect as the printed book did beginning some 500 years ago. This brings to mind the observation of Marshall McLuhan that each new technology "turns its predecessor into an art form. "2 Books will indeed survive the onslaught of downloadable e-books, but as we depend less and less upon books for information or even as the most convenient way to access information, we will increasingly value them as an art form, as McLuhan put it—as beautiful objects and works of great craftsmanship, exemplified in the rise of popular institutions such as the Minnesota Center for the Book Arts. And what about Victor Hugo's claim that books ultimately trump buildings? Downloadable e-books have not "killed" the library as a building type, but as happened with the cathedral after the widespread adoption of the printing press, libraries have increasingly become places where people go to have experiences that they cannot find anywhere else. Like the modern cathedral, the modern library will likely have a greater array of functions; play a more social and less didactic role in people's lives; and, at least partly, lose the primary purpose they once served of storing large quantities of books. It may be that, in the future, we will go to libraries to admire the craftsmanship of books and then interact with others about what we have learned from the information we have downloaded on our portable devices. The biggest effect of the digital revolution, though, may be less material and more metaphorical. As McLuhan argued, the "medium is the message," with major changes in media leading to changes in our metaphors and to the meanings that we ascribe to the world.3 The mass-produced book led to a view of the world as a kind of machine, a metaphor that reflected the very thing that made this new media possible: the printing press. And that change in metaphor, in turn, led to many of the revolutions that followed: the Protestant Revolution in the sixteenth century, the Scientific Revolution of the seventeenth century, the Democratic Revolutions of the late eighteenth century, and the Industrial Revolution of the nineteenth century. Computing, though, also gave us the Internet. And with that, along with the miniaturization of computing in mobile devices, we have gradually realized that computers represent not just a faster form of computation but an entirely new medium, which has brought with it a new metaphor that increasingly dominates our view of the world. It took machines, in other words, to move us from a mechanistic view of reality to a networked one. We no longer view the brain as a kind of computer, but instead as a neural network; no longer speak of society as a well-oiled mechanism, but instead as a social network; and no longer see the human body as a machine, but instead as part of the web of life. This shift in metaphor matters even more than the media that has prompted it. We will, of course, continue to use machines just as we will continue to use books, and so our material world will remain layered with technologies of the past as well as the present. But when we start to think of ourselves and see the world differently, big things begin to happen, as we saw in the wake of the printing press. Human relationships and social structures change, as we have already seen in the "Arab Spring" revolutions taking place in areas like North Africa, fueled by the crowdsourcing capabilities of cell phone technology; in the micro-lending revolution in the developing world, enabled by the financial transfers possible through social networks; or in the green revolution going on around the world, empowered by our access to information formerly out of reach of ordinary people. The metaphor may ultimately be the message that matters. This metaphor of the world as a network or web will alter our intellectual lives as well. The old machine metaphor privileged physics, mechanics, and engineering—three of the fields most closely associated with mechanisms. The new web metaphor, instead, draws from fields like biology and ecology, seeing in their understanding of how natural ecosystems work a parallel to the networked world we now occupy and informing us about human ecosystems and how they relate to each other in particular places. The increasingly weblike way of seeing the world, in turn, has profound implications for how and in what form we will seek information. The printed book offers us a linear way of doing so. We begin at the beginning—or maybe at the end, with the index—and work forward or backward through a book, or at least parts of it, to find the information we need. Digital media, in contrast, operate in networked ways, with hyperlinked texts taking us in multiple directions, social media placing us in multiple communities, and geographic information systems arranging data in multiple layers. No one starting place, relationship, or layer has privilege over any other in such a world. The linearity of the book, compared to the multiplicity of the web, leads to an even more fundamental shift in how we assess reality: from a temporal to a spatial one. Like reading a book, we see time as an arrow, a linear path with starting and ending points. While we learned from Albert Einstein that we could slow time down depending upon how fast we accelerate, we cannot reverse time or occupy different speeds of time at the same time. But that is not the case with space. Like the web, we can manipulate space, move in multiple directions within it, and reverse it—tear a space down, for example—if we choose. The worldwide web, of course, often seems aspatial. It connects us to people and places not in, and often far from, the actual spaces we occupy. Indeed, this new weblike way of engaging in the world appears to have collapsed both time and space, making everything that ever existed anywhere in the world immediately available to us, as if temporal or spatial distance no longer mattered. Such effects, however, disguise the essentially spatial nature of digital media. The laterally linked and complexly networked nature of the web gives it a spatial form, conceptually if not always physically. And the layering of data and simultaneity of information through the web makes it place-based, even if that "place" exists in virtual space. This line of thinking, in turn, suggests that the current way we store information—through digital documents and files—and distribute it—through e-mail, e-books, e-zines, and the like—may represent a transition stage in this technology. Such formats mimic the forms that emerged from the printing press and paper technology and, because of their familiarity, have enabled us to adapt to the access of digital information more easily. But they also reinforce a linear way of thinking about information inherently at odds with the weblike way in which we increasingly see the world. GIS will eventually become a major way—perhaps the dominant way—in which we will access information in the future because of the essentially spatial nature of that software. Rather than see information as discrete bits, accessed linearly and temporally, like moving along a necklace of data, GIS layers information spatially, linking it according to its relevance to other data on a given layer and according to its relevance to all the other layers in a given place. It allows us to "map" information, which may become the primary way we organize, access, and distribute knowledge in the future. This use of spatial tools to match the spatial nature of a web will have a profound effect on how we think about information itself. The book led us to see information in highly discrete ways. By packaging related content between two covers, books encourage us to see knowledge as a set of distinct disciplines, each with its own discourse and eventually its own set of assumptions and use of language that made it increasingly hard for anyone else not in that discipline to understand. And by sorting information according to disciplines, books enabled us to think of knowledge divorced from any particular physical or conceptual space. As a result, we can take almost any subject—say, water—and find that topic addressed in myriad ways by many disciplines—the sciences and social sciences, literature and history, art and poetry—all located in different places in a library and all addressed in different ways through different disciplinary lenses. That way of organizing knowledge has served us well in the last several centuries as we have sought to understand and control the world around us. But it's gotten in our way in recent decades, as we have come to realize the damage we have done to the world and the threat that that poses to our civilization and to us. It has led, for example, to what Adam Smith called the paradox of value, when he asked, at the beginning of The Wealth of Nations, why we so value diamonds that have so little real use, and why we don't value water, without which we cannot live.7 By dividing information into discrete, disciplinary units, we have created what we might call the paradox of knowledge: in which we have so much information about the world and yet remain so ill informed about our effect on the world. This suggests that we may need to arrange knowledge differently in the future, not according to disciplinary categories, but instead according to spatial phenomena and, as Smith would say, to the things without which we cannot live. GIS offers one way of doing so. While the data-rich digital mapping of GIS arose, initially, to ease geographic analysis and enhance spatial decision making, it has the potential to organize knowledge in ways that align more closely with the ways in which the world itself is organized: spatially. That may make sense in spatially oriented fields, like geography, forestry, or planning, but how, you might ask, does that make sense for fields that appear to have no spatial equivalent: philosophy or pharmacy, history or histology, literature or linguistics? It's a good question, but maybe the wrong one to ask. It may be that we need to stop asking how to preserve our disciplines, which, for all their value, remain abstractions of or at best partial views of the world, and instead start asking how to preserve what remains of the natural world, which our disciplines, if they have any value, need to serve. 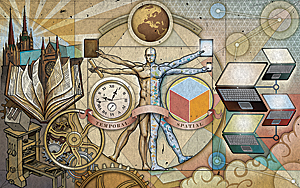 How might GIS help us spatialize knowledge? Rather than organize knowledge by type or discipline, we could use GIS to embed all the knowledge relevant to a place in the myriad layers of information about it. And as we scroll over a place, we can select the pertinent layers and begin to see the relationships among disciplines and the connections among data. So many talk about the need for interdisciplinarity, but as long as we organize knowledge in disciplinary silos, the connections among disciplines will continue to elude us. When we instead begin to organize knowledge spatially, the connections come to the fore, as we focus less on the layers and more on the overlay of them and on their relevance to particular situations. This, of course, may seem too much to ask: the reorganization of knowledge and the spatializing of education. We have, however, managed over the last couple of centuries to temporalize education. Every field has a history, and almost every one requires that students study the history of the discipline as part of knowing it. Indeed, historical understanding has become such a part of what we define as an educated person that we take it almost for granted, but it wasn't always so. It wasn't until the nineteenth century that we assumed, as Georg Hegel argued, that we couldn't fully comprehend anything without knowing its history. In the first decades of the twenty-first century, we need to see that the same holds true for space as much as it does for time. We cannot fully understand any field without also spatializing it, without also seeing how it relates to every other discipline as they come together in particular places, with a given group of people, in specific social and environmental contexts. We need to know how disciplines evolved over time, but we also need to know how they, so to speak, hit the ground and how they play out as part of the web that constitutes the whole of a place and of the people there. This does not mean that we should see such spatial analysis as an end in itself. Except for historians, we rarely study temporal phenomena—history—as an end in itself. In most fields, history serves as a means to an end, as a way of better understanding how the present came to be and what the future might hold. The same is true for a spatial understanding of our fields. Except for a few fields, like my own field of architecture, which does study space as an end in itself, most disciplines will likely see this weblike, spatial turn in our thinking as a means of understanding their subject in new ways. Space represents, like time, an a priori condition, as Immanuel Kant argued—a precondition to everything else, and so having a sense of the relationship of space and time—how a field evolved spatially as well as temporally, what happened where as well as when—will increasingly become necessary to fathom how we have done so much damage to so many places and to the cultures of so many people on the planet even as we purportedly know more about them. The spatializing of knowledge via its mapping onto places has another advantage as well: it becomes a visual way of conveying information across the barriers of language and to the growing percentage of the human population that remains illiterate. The book divides the literate and illiterate and, as such, has helped reinforce the power of the former over the latter. Hugo understood that when he had the archdeacon hold up the book as killing the building. The medieval cathedrals spoke to both the literate and illiterate and, in some respects, the book made large stores of knowledge inaccessible to the latter. The digital divide threatens that as well, with the wealthier parts of the world having much more access to information than the poorer parts. The web and cloud computing may help end that division by making most of what we need to know available at low cost, with "dumb" devices able to access information anywhere in the world. But there remains the problem of literacy, as well as translation, and so closing the digital divide through such devices will only partly close the gap that exists between those who have access to knowledge and those who don't. We may never close the latter until we spatialize knowledge through the use of visual tools like GIS. Enabling people to see the information relevant to their lives, whether or not they can read, and to map it to the places they know to understand the conditions that affect their lives, could have a transformative effect in empowering those who have been left behind by the book and even by the early incarnations of the computer. If the medieval cathedral tells its stories in stone and glass, GIS tells them through layers and overlays. Both do so visually and spatially, both speak to viewers whose language or even whose literacy may not matter, and both reveal relationships and meanings that no book could ever capture. 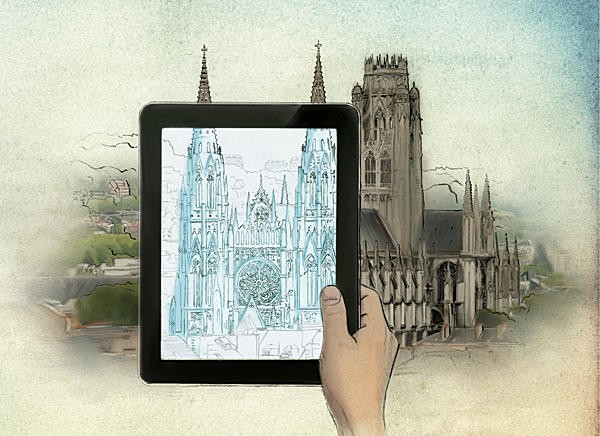 At the same time, the medieval cathedral and digital cartography both have the power to move us to action, to help us see things with our own eyes and without the interpretation of an author who might want to edit what we know or affect what we think. Just as the book helped give rise to the Protestant Revolution, in which people wanted to read the Bible for themselves and make up their own minds, so too might the visual and spatial power of GIS someday give rise to a secular version of the same, in which people, protesting the power of a few to control so much of the knowledge about the world, will want to see that information for themselves and make up their own minds. This leads to my final point about the spatializing of knowledge. The temporalizing of knowledge has, through the agency of history, helped us understand the past and possibly comprehend how the present came to be, but rarely do we venture very far into the future. We call that science fiction or fantasy to set such future-oriented thinking apart from what we can reliably know about the world as it is or as it once was. And we tend to see such work as somehow of lesser quality or validity than what the sciences, social sciences, and humanities offer. But spatial understanding has a different relationship to the future, as well as the past and present. 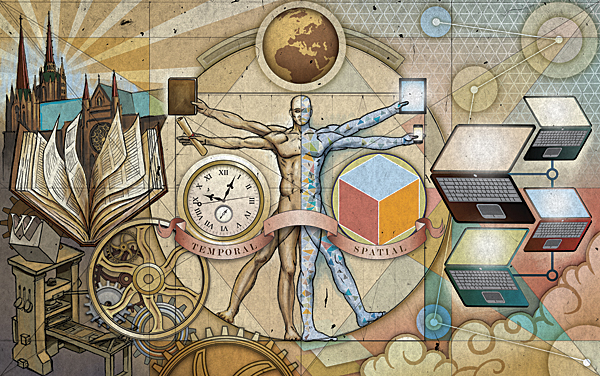 Spatial knowledge recognizes place, rather than time, as the ultimate continuity in our lives. And while none of us can see the future as a temporal idea, we continually imagine the future of places, projecting possible spatial arrangements based on what we see around us. The design disciplines do this all the time, using spatial means to imagine what could be, envisioning the future of a place, product, or environment, and depicting that visually for others to see. We commend or criticize a design and accept or alter it to fit our idea of what should happen in a particular place or with a particular product. We don't consider design a lesser discipline, simply a different one, operating according to its criteria and assumptions. I mention this because the leading edge of GIS rests with the idea of "geodesign," the use of geographic analyses of what is as the basis of making design decisions about what could be. Rather than see future-oriented thinking as somehow fiction or fantasy, geodesign allows us to connect what we know about the world with what we might want the world to be. Just as GIS can serve as a means of organizing knowledge spatially, geodesign might serve as a means of projecting that knowledge into the future and assessing its merits based on what we know about a place. Why does this matter? Because we stand on a similar precipice as Hugo's archdeacon, with even more drastic implications. We might well say that "this will kill that," but in our case, "this" represents modern civilization and "that," the natural world. Since the rise of the book, although not necessarily because of it, we have devised a Ponzi scheme with the planet over the last couple of centuries, exploiting natural resources, other species, foreign cultures, and even future generations to keep those at the top of this pyramid scheme enriched. As we know from the collapse of other, smaller Ponzi schemes, such frauds cannot last. They tend to collapse suddenly and without warning, and those most enriched by the scheme—us—have the farthest to fall. The only way we can avoid such a fate is to realign our relationship with the natural world, to reorganize our considerable knowledge about it to reveal the forces that lead to our unsustainable practices, and to relearn how to steward what remains of the planet we have so altered. And if we don't, we have only to alter the terms of Hugo's observation only slightly. This—the collapse of our Ponzi scheme—will kill that—the civilization we have built up over the last 200 years. The spatialization of our knowledge, in other words, isn't just an academic exercise or the result of some arcane interest of a few spatial thinkers or GIS specialists. With it, we can begin to set the foundation for a more sustainable future for ourselves as we see the impact of our actions and the relevance of our knowledge to the particular places in which we live. This will not kill anything except the ridiculous illusion that we can continue to live beyond the carrying capacity of our planet. And doing so is not just about space; it's about time! Thomas Fisher is a professor in the School of Architecture and dean of the College of Design at the University of Minnesota in the Twin Cities. This paper is based on Fisher's keynote address to the GeoDesign and Spatializing the University meeting of the Big 10 university librarians, May 2012. For more information, contact Thomas Fisher, University of Minnesota (e-mail: tfisher@umn.edu). Hugo, Victor. The Hunchback of Notre Dame. New York, New York: Modern Library, 2002. Book V, Chapter 2. McLuhan, Marshall. Understanding Media, The Extensions of Man. Cambridge, Massachusetts: MIT Press, 1994. Preface, ix. Tolstoy, Leo. War and Peace. New York, New York: Modern Library, 2002. p. 241. Le Corbusier. Towards an Architecture. Los Angeles, California: Getty Publications, 2007. Sample, Ian. "Stephen Hawking: 'There is no heaven; it's a fairy story,'" The Guardian. Sunday, May 17, 2011. Smith, Adam. The Wealth of Nations. New York, New York: Modern Library, 1994. Book 1, Chapter 4. Eco, Umberto. The Aesthetics of Chaosmos: The Middle Ages of James Joyce. Cambridge, Massachusetts: Harvard University Press, 1989.